I stopped taking photos of pots to take a picture of the backyard. 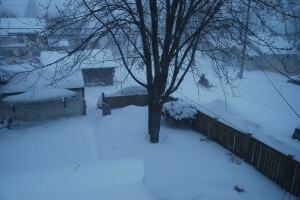 Good timing I caught a neighbor snowmobiling by. Ha! My Giants are trying to make it there for the game tomorrow. They are currently hanging out in the KC Airport. I hope you are staying warm. While the snowmobiles are loud, I have to say I’m always glad to hear/see people enjoying a good snow!